Amalfi QuiltAmalfi Quilt, Fog alt="Amalfi Quilt, Fog"
Print We spotted these gorgeous graphics from an extensive textile library we found on our travels. Obsessed with their beauty, we reimagined them as layering pieces for the bed, fine-tuning the pattern pairings ‘til they were just right – lively, versatile, and lots of fun to mix and match. The reversible designs showcase exceptional attention to detail and let you change up your look in no time flat. Block-printed and quilted by hand, each piece is truly unique, with that perfectly imperfect quality we love about handcrafted textiles. Lightweight enough for warm nights, cozy enough for chillier ones. 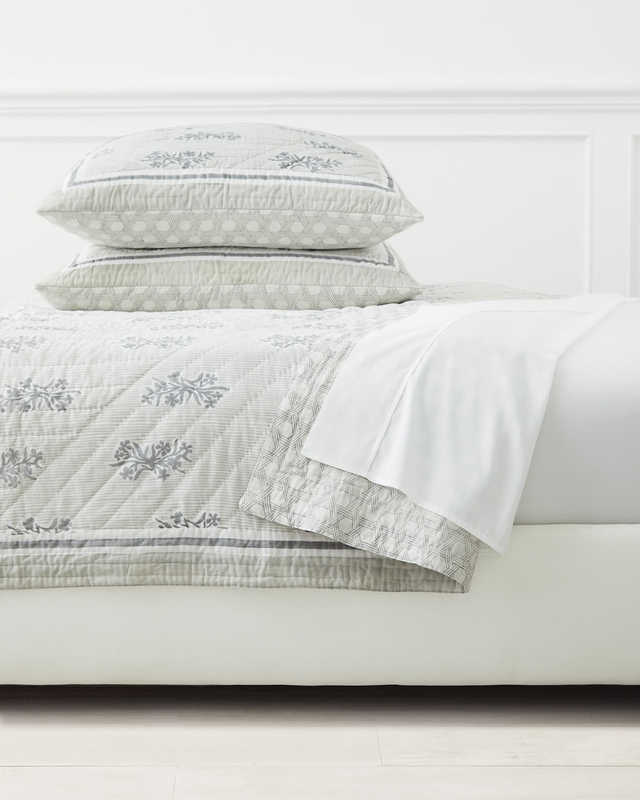 Individually block printed by hand, each piece will be unique, making your bedding truly one-of-a-kind.